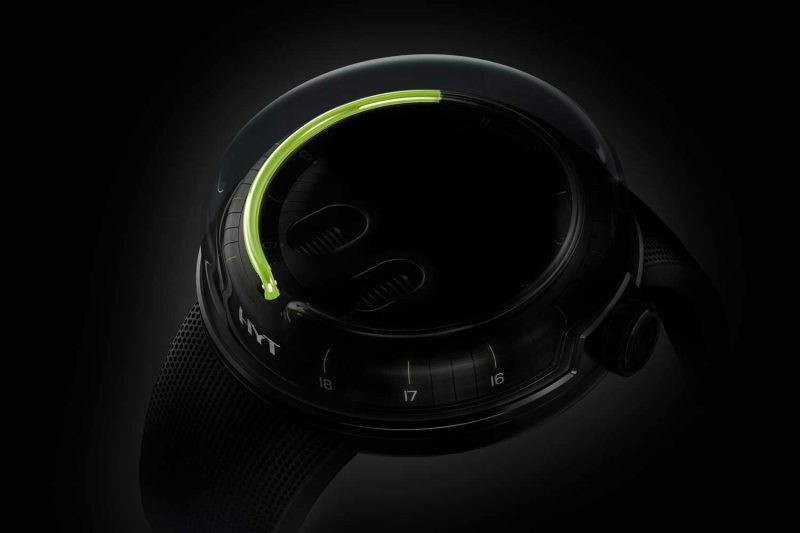 Water is the key to life, and liquids are the key to HYT. Liquids have always been important to timekeeping: in fact, some of the earliest clocks were water clocks (these clepsydras date back to the age of the Egyptian pharaohs, 3400 years ago), timepieces that measured time by measuring drops of water, drops hitting the surface of the clock’s basin and spreading out into perfect circles of motion. In later years, watchmakers spent a great deal of energy trying to keep liquids out of timepieces. 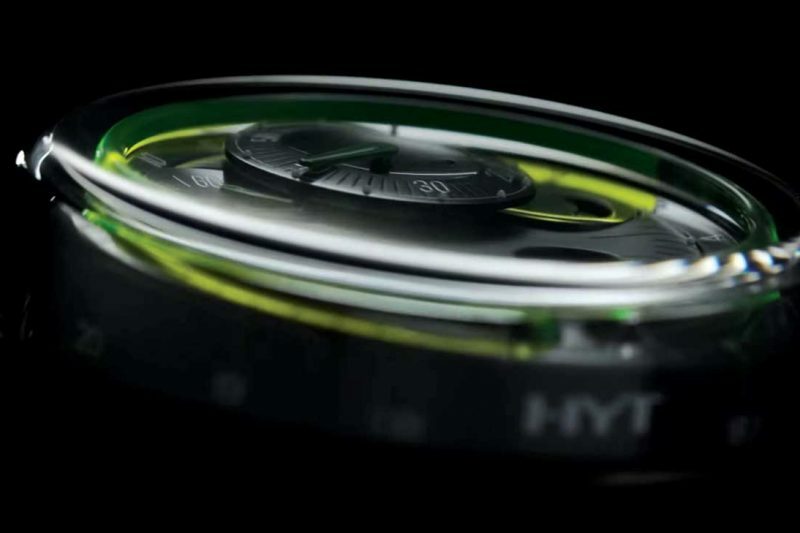 Then, HYT brought liquids back inside watch cases, sending shock waves through the watch industry. After many iterations, including the ultra-modern, the classical, skulls, Damascus steel and other new materials and even mechanical lighting systems, HYT has come full circle, back to the origins of the brand. 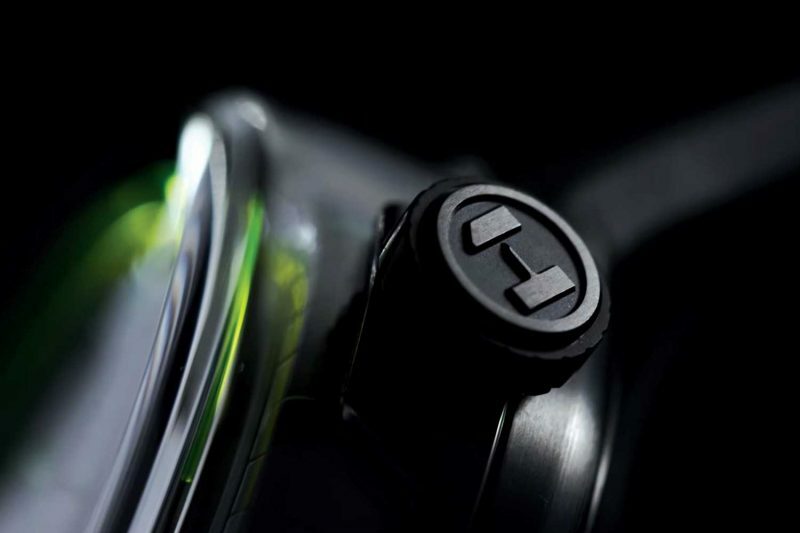 The new H0 from HYT is inspired by those early clepsydras, the case itself a perfect circle, the liquid moving inside a circular capillary within the timepiece indicating the hours, while traditional hands show the minutes and seconds. The H0 is a back-to-basics timepiece for HYT, putting the liquid technology front and center, and at the same time heralding a new design language for HYT, focusing on pure shapes and minimalism. At the same time, there is an element of hedonism to HYT, a passion for the pleasure of what the company is doing that is undeniable. 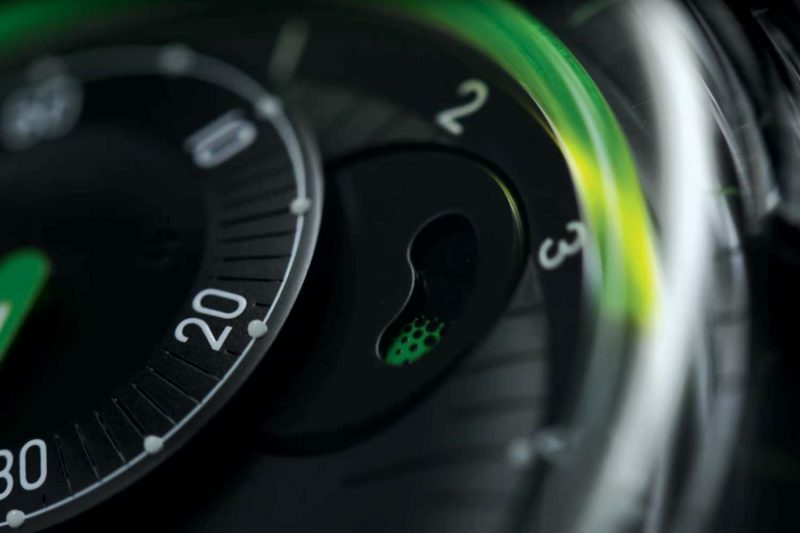 HYT has always been willing to push the boundaries of whatever it does–watchmaking, liquid displays, communications, even the photography accompanying this story, which is meant to celebrate life and the passions we have. To make an HYT timepiece, you have to be ready to do something totally different, something so far out of the box that you can’t even see the box anymore. To put liquids inside a timepiece requires bravery and passion. No one ever considered introducing liquids inside a watch, on purpose. 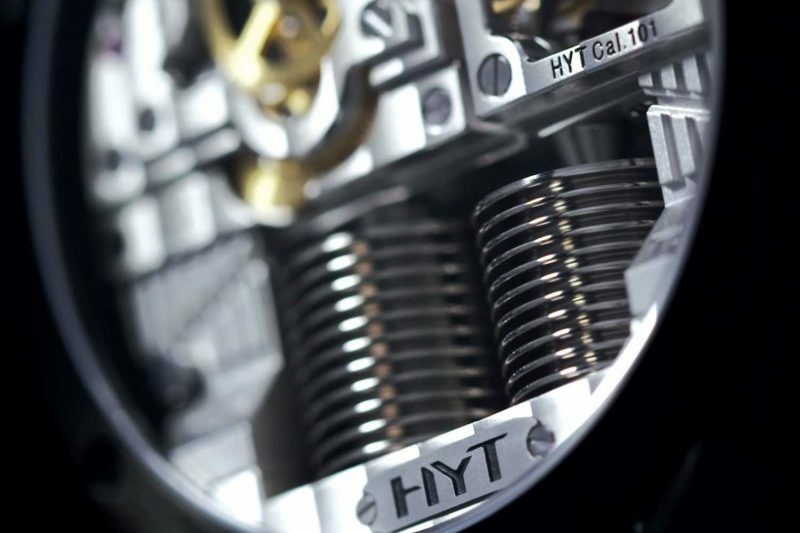 It could be argued that HYT’s debut is the boldest advancement in watchmaking in decades, or even centuries. 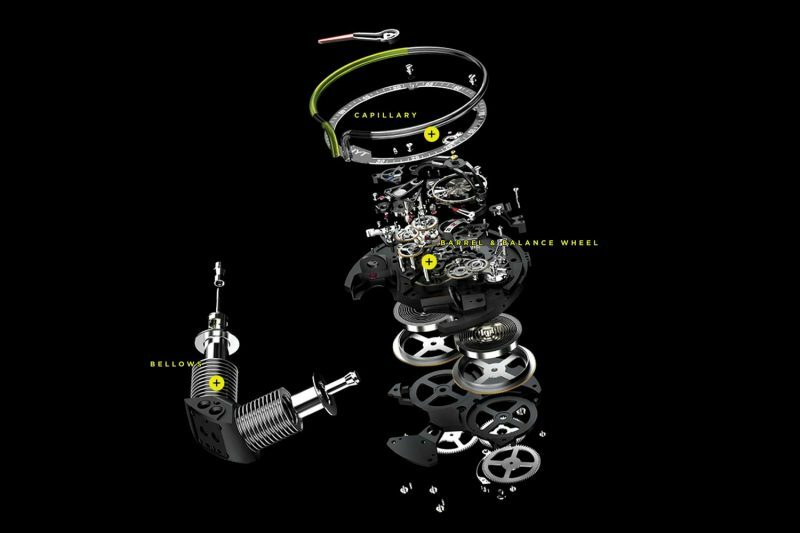 A sea of change in high watchmaking, all driven by the intersection of liquid and mechanical watchmaking. For centuries, watchmakers have taken great pains to keep water, along with dust and dirt, out of their timepieces. Companies experimented with special case systems that would allow watches to go under the water, while keeping the movement safe from the intrusion of water. They have been singularly successful, and even the most novice of watch lovers knows that water inside a watch will destroy the mechanism. Well, thanks to HYT and the H1 introduced in 2012, that has changed. 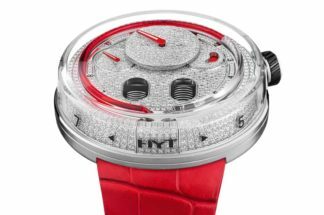 When HYT introduced its first watch, I remember the many people within the watch industry scoffing and chuckling, these Doubting Thomases certain that HYT would fail, and fail in spectacular fashion. 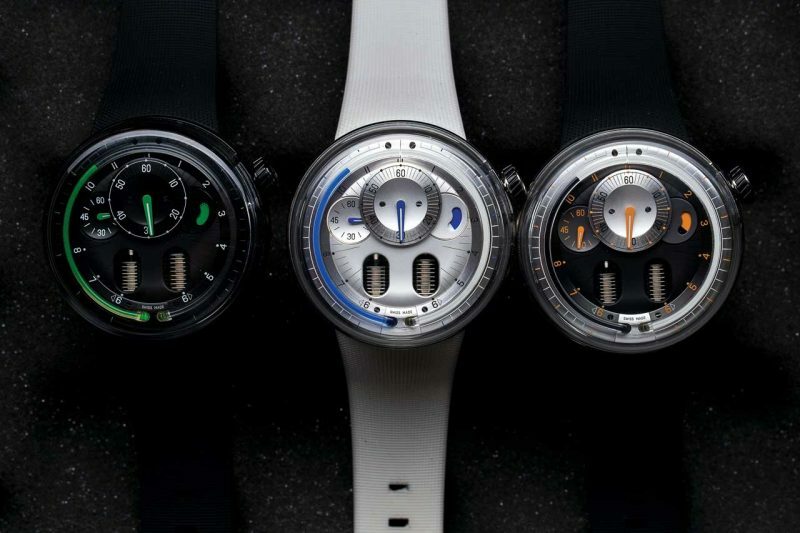 Despite, or perhaps because of, these naysayers, HYT persevered and has become one of the leading independent companies, thriving when many technology- or design-driven brands are struggling or disappearing altogether. Why has HYT been successful where others have not? According to Grégory Dourde, CEO of HYT, it’s the combination of the classical and cutting edge in one watch, something no one else has. 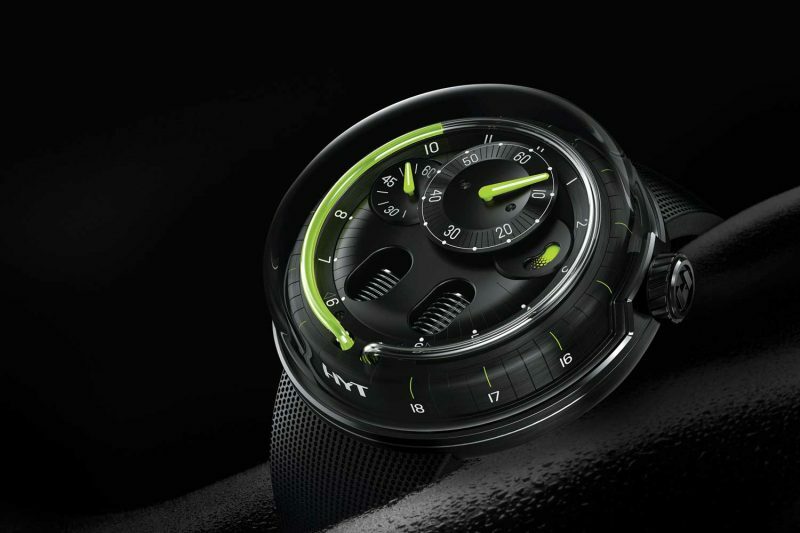 “HYT is Hydro Mechanical Horology,” Dourde points out. “In reality, we have two DNAs with which we play. First of all, there is traditional horology, as realized in the mechanical movement. This is something that is much more related to the past, the heritage of watchmaking. While what we do is quite modern, it’s still mechanical watchmaking, crafted as it has been done for centuries. The H0 puts the liquid timekeeping aspect of HYT on full display, with a special sapphire crystal that wraps around the round dial of the watch, making it even easier to see the liquids at work. “We decided to make a watch that will put our liquid technology on display, and the aim was a 3D indication of the time,” Dourde explains. “We have this remarkable capillary into which we have the liquids that flow, and we wanted to make it the star of the watch. We didn’t want to hide where the capillaries start and end, so all the details are on display. To create this watch and the other HYT models, it’s always a mixture of traditional and contemporary. HYT has to be continually emphasizing and focusing on contemporary scientific research to stay on top of all the developments. 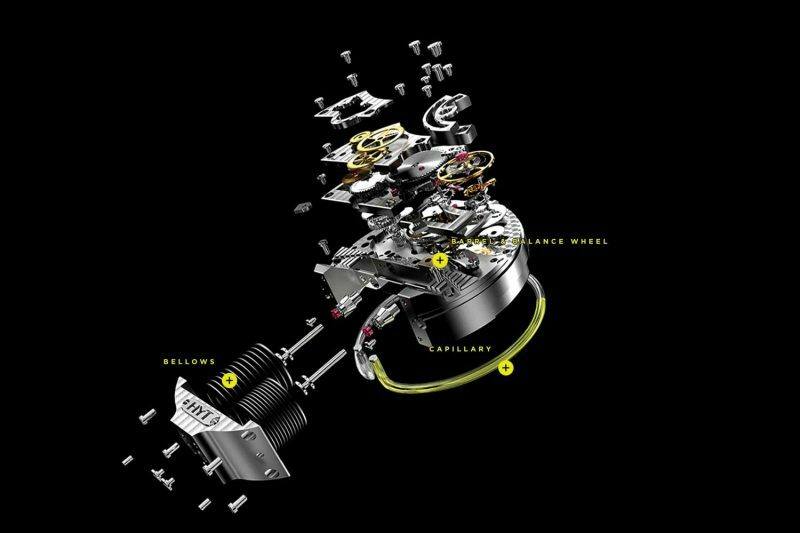 Many of the components come from NASA suppliers, and HYT has partnerships with the best universities in the world, and the brand has co-developed its systems with the best in the world in aerospace and other cutting-edge sciences. 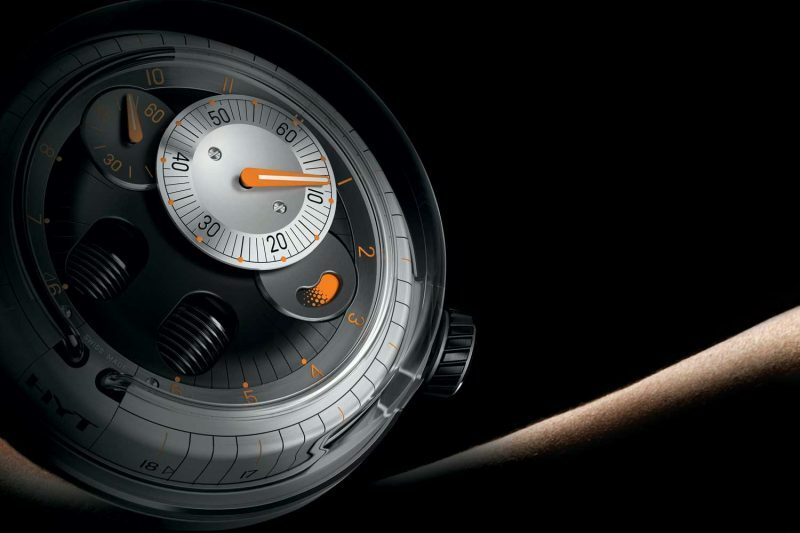 At the same time, the creation of the H0 heralds a new design language for HYT, focusing on pure shapes, all with the aim of spotlighting the unique three-dimensional fluidic indication of time. The primary focus of this new direction is the pure design and architectural references. 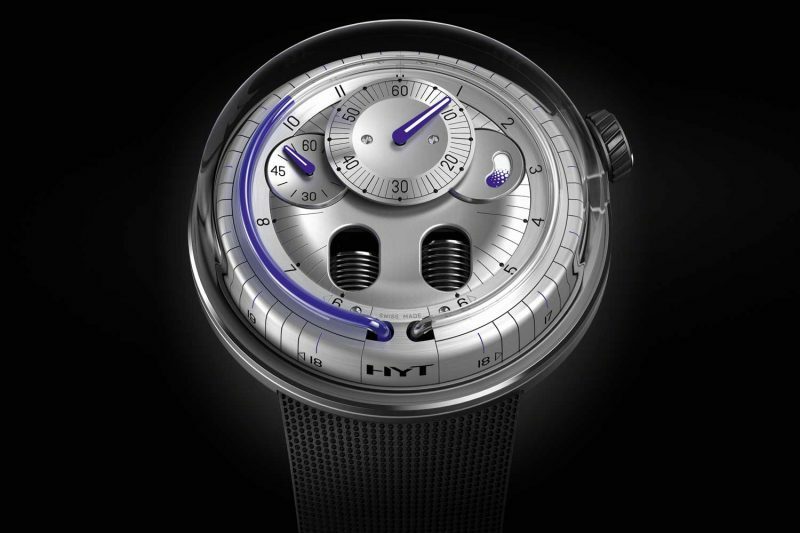 The H0 also brings HYT into a new, lower price category, with the H0 starting around $39,000. Changing the design language for the H0 was a risk for HYT, as it could have been content to ride its wave of success for as long as it could. The hallmark of a brand that has the potential to stay for the long haul is the willingness to take chances, to reinvent itself, to go boldly where no brand has gone before. So far, according to Dourde, the response has been overwhelmingly positive, from end clients, retailers and journalists. 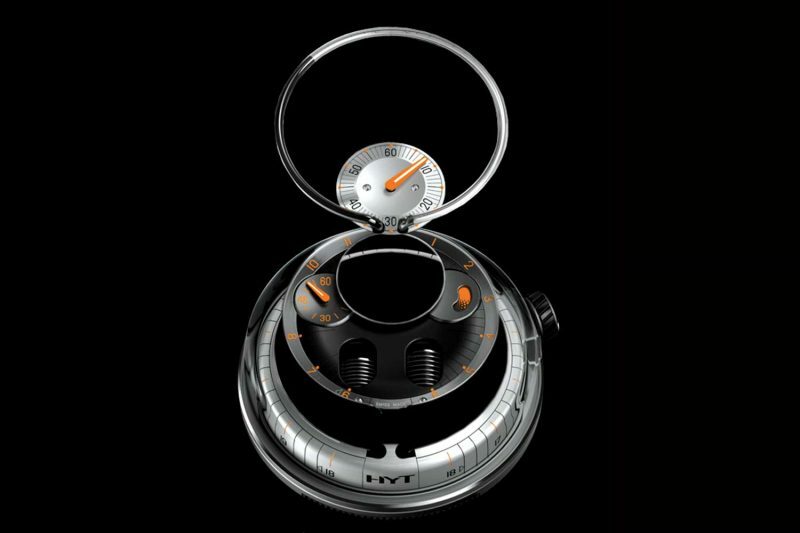 All the things that make HYT what it is are present in the H0. Not only does HYT have to work on the complications of mechanical watchmaking, of which there are many, they also have an added level of complexity with the systems that indicate the time, powered by the mechanical movements they use. The hours are indicated by two liquids inside the capillary, one colored and one clear, and their juncture creates the demarcation of the time. 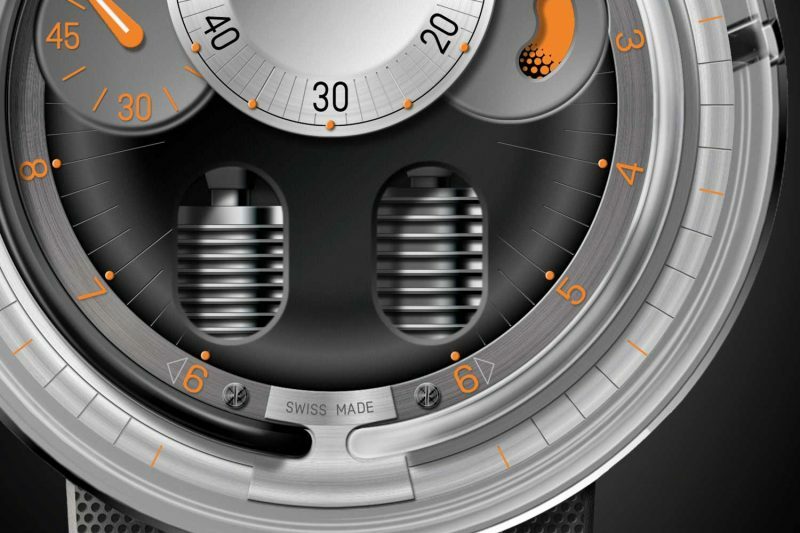 This combination of liquids seems easy enough, but it is one of the central points of complication for HYT. Getting the liquids right, along with their interaction with the material making up the capillary, was an intense chemical challenge as some liquids worked for color but mixed together, while others left remnants behind when the liquid moved back and forth inside the capillary. Two flexible reservoirs are in the watch, with a capillary attached at each end. One of these reservoirs contains the colored liquid, while the other holds a transparent liquid. What stops them from mixing is the repulsion force of the molecules in each fluid. The bellows are another complication as well, as they have to push the liquids through the capillary, then draw the liquids back in when the time cycles back and the liquids start to move through the capillary again. The two bellows are made from an incredibly strong and supple electro-deposited alloy and are moved by the mechanical movement. The hours are indicated by the colored liquid released when the first reservoir is compressed. The colored liquid travels through the capillary, pushing the transparent one back into its own reservoir and then returning to its original position at six o’clock in a speed-controlled and retrograde manner, as do clepsydras. 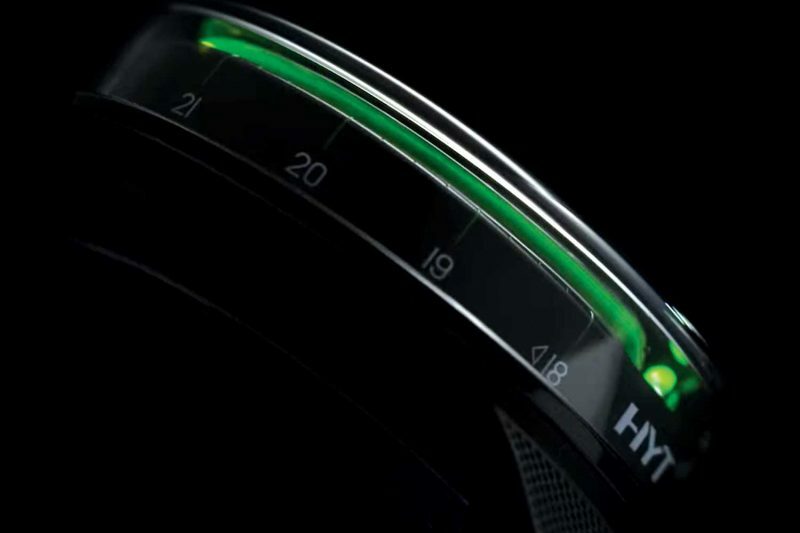 HYT’s sister company, Preciflex, is responsible for all the R&D and heavy lifting when it comes to the liquid technologies, while HYT focuses on developing the watches, working with the movement and design of the timepieces. Dial: Unstructured, fluid hour display; black opaline or silver hour dial; engraved numbers and hour indexes with Super-LumiNova; micro-blasted and satin-finished black opaline central dial; micro-blasted and satin-finished black or silver opaline minute dial; micro-blasted and satin-finished black opaline seconds dial; micro-blasted and satin-finished black, gun or white opaline power reserve indicator; green, blue or black minute and seconds hands with white Super-LumiNova; regulator at 12 o’clock. The mad scientists behind HYT are out to change how we read and experience the time. “Liquids have something organic to them,” Dourde points out. “With an HYT watch on your wrist, you live differently. 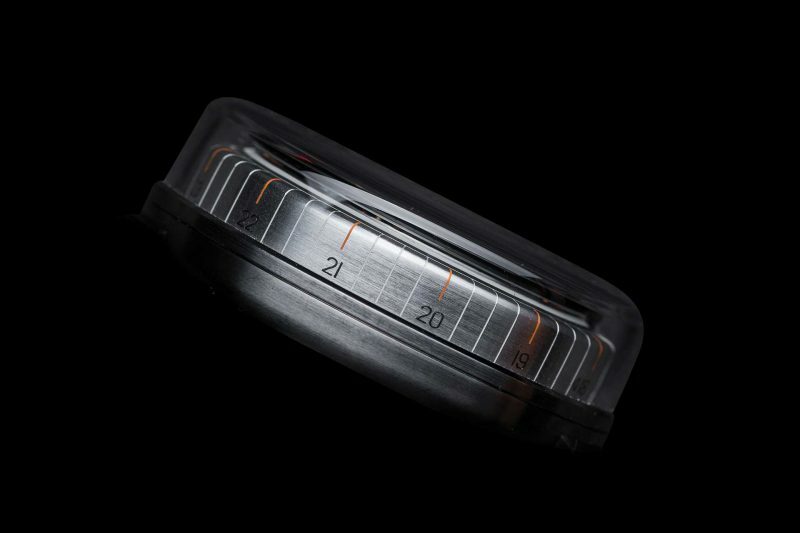 Instead of being a tool to tell the time, the HYT capillary system is like a gauge. Look at computers; everyone uses this progress bar—what we have with our time indication is a contemporary progress bar, and you automatically see where you are in your day. As a result, it’s not just a watch, it’s an object of interaction. On the one hand, HYT doesn’t take itself too seriously because watches have ceased to be about telling the time and more about expressing an approach to life. “A timepiece today is more an object of art than a watch because our customers are really in transition,” Dourde says. “When I really want to know what time it is, I can find it in many places. I rarely look at my watch to tell the time. Wearing an HYT timepiece is all about appreciation, pleasure, gratitude for what you have and for the opportunities you have had in your life. Though several chapters have already been written in the HYT story, it’s still early days. The brand knows that there is much still to be done, and it will be a long time before HYT is considered part of the mainstream watch industry. According to Dourde, HYT has to tread lightly while emphasizing the cutting-edge technology and still incorporating classic watchmaking. 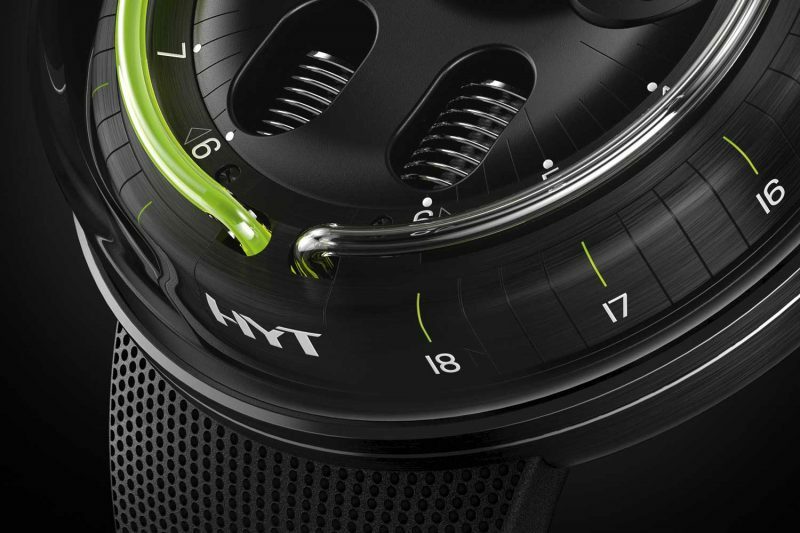 Everything HYT does will underscore the hydro-mechanical aspect of its timepieces, its unique mix of the liquid technology with contemporary watchmaking. The USA is a natural market for HYT, and for the first time ever HYT is focusing on what they consider will be the best market for the brand in the future. “I think we are the most American watch of all the Swiss watch brands, with the suppliers we use and the technologies we put front and center,” Dourde says with a smile. 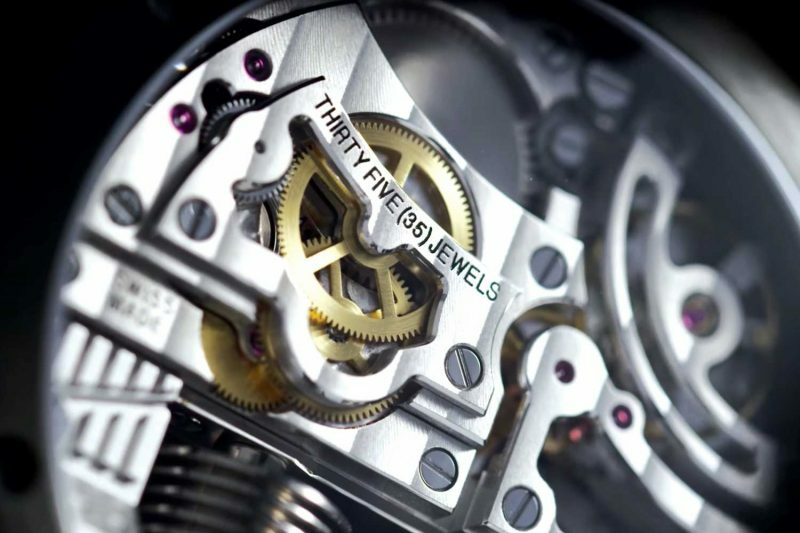 “The most expensive parts of our watches are from the US—the bellows, the coatings and more. Honestly, we have the most American added value timepiece meeting the Swiss Made criterion. So, for HYT it’s our most natural market. HYT goes back to its origins with the H0, and it’s a fantastic way to reimagine its unique mixture of cutting-edge hydro technology and traditional watchmaking.